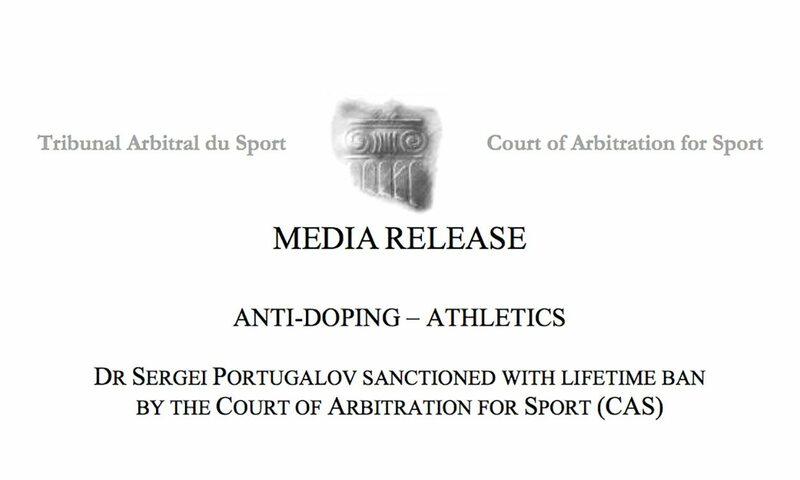 Russian doctor Sergei Portugalov has been banned for life by the Court of Arbitration for Sport (CAS). In a statement released on Monday (March 13), the CAS said there was “clear evidence” that Portugalov had violated IAAF anti-doping and medical rules. Due to the current suspension of the Russian Athletics Federation (RusAF), the CAS acted as first-instance decision-making authority for the case. “The Court of Arbitration for Sport (CAS) has issued its decision in the arbitration procedure between the International Association of Athletics Federation (IAAF), the Russian Athletics Federation (RusAF) and Dr Sergei Portugalov, a Russian medical doctor who advised athletes affiliated to RusAF,” read the CAS statement in part. “On the basis of clear evidence, Dr Portugalov is found to have violated the following articles of the IAAF Anti-Doping and Medical Rules: Article 32.2(f) [“Possession of a Prohibited Substance or Prohibited Method”], Article 32.2(g) [“Trafficking or Attempted Trafficking in any Prohibited Substance or Prohibited Method”] and Article 32.2(h) [“Administration or Attempted Administration of a Prohibited Substance or Prohibited Method”]. The suspension of RusAF as an IAAF Member has been in place since November 2015 and it came after a World Anti-Doping Agency (WADA) Independent Commission report detailed findings including a “deeply rooted culture of cheating” in Russian athletics. Speaking earlier this year, IAAF Taskforce independent chairperson Rune Andersen stated that an expected earliest date for reinstatement would be November 2017.